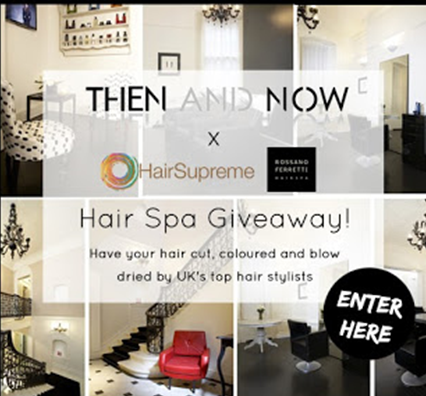 Never have a bad hair day again.. THEN AND NOW HairSupreme: Luxury Hair spa Giveaway! It’s about the HAIR from the colour to the volume of it! The girls at THEN AND NOW are doing exactly that since THEN AND NOW have teamed up with Rossano Ferretti hair spa and HairSupreme LTD to offer one lucky reader the chance to have his or her hair cut and coloured by two of the UK's top hair stylists. The one lucky reader will have their hair cut and blow dried by none other than Alessandro Calvio, recommended twice by Vogue UK's diary as one of the "best blow dry’s in town" and featured in publications such as the Evening Standard, Tatler, Grazia and more. Then colourists to the stars Carl Dawson will be on hand to mix and create the coloured hair of their dreams. Carl was voted one of the top 10 colourists by UK Style Magazine and has worked with numerous celebrities such as Kate Moss, Sienna Miller and even royalty! The total prize is worth over a whopping 500 pounds! All you need to do is click through here and fill in the forum.